It’s been years since “the miracle,” and Gwen and Rhys have settled into a quiet life with their daughter, far, far away from Torchwood, aliens, and any such things. So it’s with a bit of trepidation that they respond to a late-night phone call claiming that Jack Harkness (whom they haven’t heard from in years) needs their help . . . and yet, how can they help but respond? Leaving their daughter with Gwen’s mother, the two drive to a nursing home in northern Wales, hoping to find Jack and save the world (again). But what they find is enough to leave them more than shaken, even with all they’ve seen in the past. 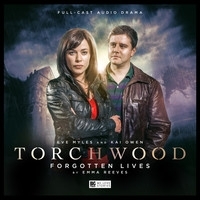 Forgotten Lives is a pretty solid contribution to the Torchwood canon. 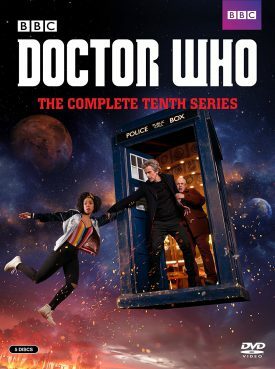 It’s a full-cast audio drama set a few years post Children of Earth, and it does make allusions to that, so mild spoilers there. As for the cast, the only main-cast members to show up are Gwen (Eve Myles) and Rhys (Kai Owen). Jack does show up as well (naturally), but not in his own body, so no John Barrowman appearances here–bummer that. The acting is solid, and the flow of the story is easy to follow. I did find it interesting that the story focuses on a nursing home and the vulnerabilities of the people who live there–definitely some social commentary going there, despite the main threat being (once again) an alien invasion. As is typical for Torchwood, this leads us to some dark places, so fair warning there–as with literally everything related to this series, I would recommend avoiding if you’re prone to depression. But yeah, for those who enjoy the series, Forgotten Lives is an interesting continuation going beyond what we got in the show and is worth checking out.